FOCUS stands for the Fellowship of Catholic University Students. 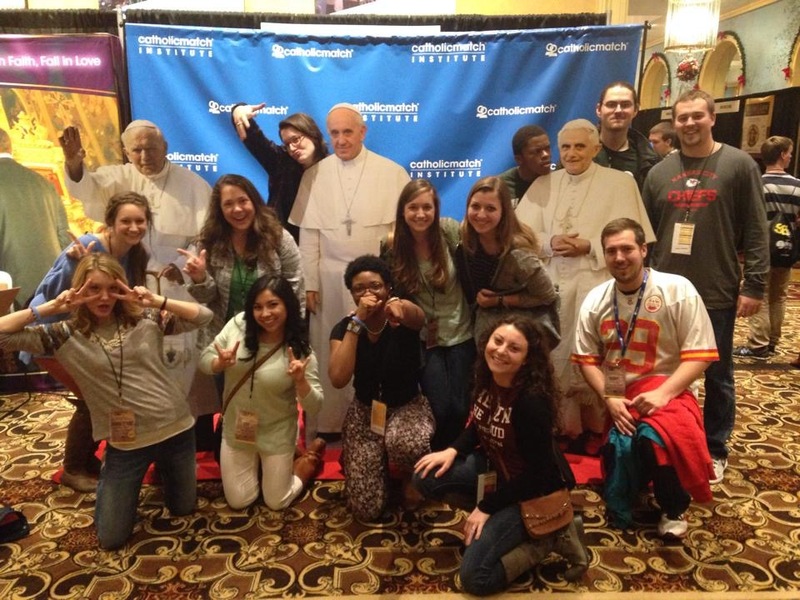 The SEEK conference was Jan. 1 – 5 in Nashville, Tenn., at the Gaylord Opryland Hotel. 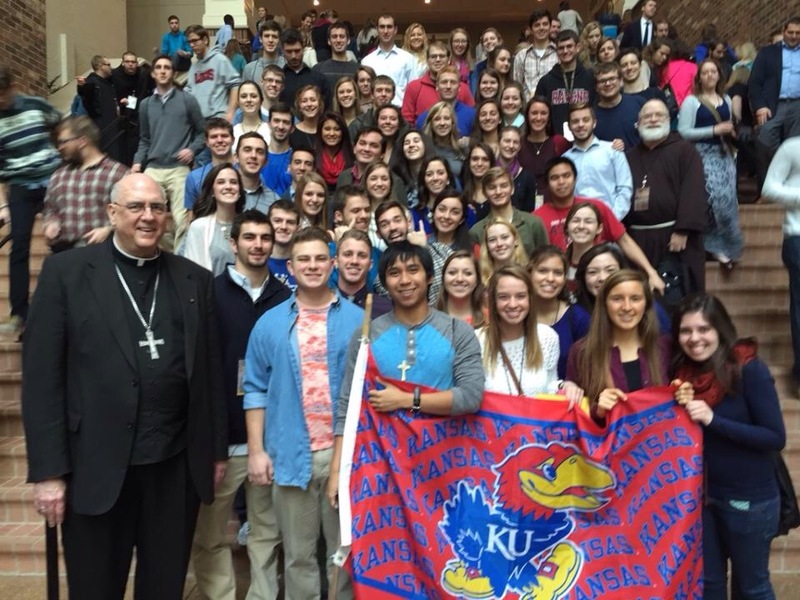 University of Kansas students with Archbishop Naumann after mass Sunday, Jan. 4 in Nashville, Tenn. at SEEK2015. Photo via Lauren Schulte (FB). Good news: I brought someone new along with me, but I also left a new person. I’m re-energized and ready to finish my college career at the University of Kansas. The first semester of my senior year was stressful. SEEK provided me with the proper mindset to conquer all my fears and doubts. (I’m not dwelling on my shortcomings, rather using them to help me accomplish more). There are a few key things I took away from SEEK. Confidence: It’s easy for the Devil to attack me because I lack self-confidence. For years, I struggled with body image (I’m sure a number of girls do). I believed I needed to look like an airbrushed model. Now, I’m more concerned about treating my body as a temple. You live one life, so why not stay active and eat well? (Yes, that includes cookies sometimes). Internally, I’ve also struggled with confidence. “What if I’m not good enough? Smart enough? Etc…” I play the game of comparison: how do I match up with others? I relate this back to the competitive nature of college/pursuing a career. The women’s sessions at SEEK (Sara Swafford, Sr. Mary Gabriel, Lisa Cotter, Jennifer Fulwiler) encouraged women to be their best self. These women challenged us to build each other up without tearing ourselves (or another) down. Acceptance: This attribute pairs with the first. I’ve struggled accepting God’s will for me. Instead of choosing the easier route to pursue a career straight out of college, I accepted the call to serve as a FOCUS missionary. This wasn’t an easy decision, but with discernment, I made peace with God’s call. Now, it’s time that I listen to God in other areas of my life. Prayer time during the conference made me realize evangelization is much more than serving as a FOCUS missionary. It starts, now. I should be striving to set an example for others by the way I live. And my spiritual life must be in tact before I administer to others. Trust: It’s likely I’ll always struggle with fully trusting God. Following this conference, though, I’m more peaceful than at any other time in my life. I trust that God will provide in all aspects of my life. (Even with fundraising my salary). During SEEK, it became apparent that I should be taking more things to prayer. It’s impossible for me to accomplish everything on my own. Especially, the conversion of hearts. I need to allow God to work in others and to trust those people to accept God into their lives. I’m looking forward to this spring semester. I’m more confident in myself as a student leader. And I’m confident that I can accomplish anything with God’s guidance. My new missionary friends at SEEK2015, who I met at FOCUS interview weekend in Dallas, Texas. Photo via Janna Clare Mallory (FB).